Our family believe that the combination of rearing our turkeys in an open spacious environment, along with being fed a diet sourced from crops grown by us on our own farm, results in a very local, natural product that we guarantee is displayed in the premium taste of our birds. Although much time has passed since Henry and Peggy first arrived on the farm, the principal practice in producing the heart of a truly delicious Christmas meal has certainly not been forgotten. Something that today, Patrick, Jane and their sons take great pride in. Having been rearing quality traditional Christmas turkeys at Forest Lodge Farm for the past fifty years, the Wreathall family have gained a wealth of experience into what truly makes the centrepiece of your Christmas celebration special. So when ordering your Forest Lodge Christmas Turkey, you can rest assured that your turkey has been reared to the highest standard, and most of all will taste absolutely delicious. 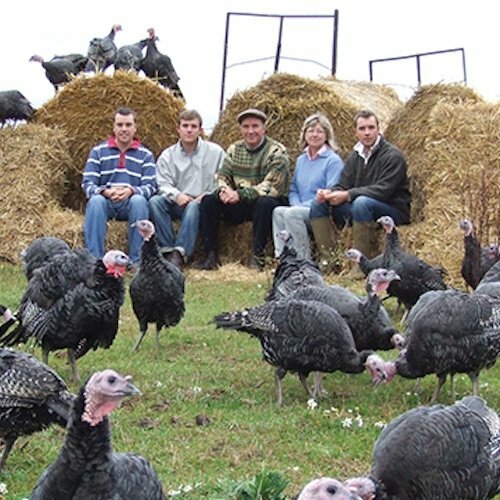 We invite you to explore our site to find out more about our farm, family and our traditional Christmas turkeys. Please remember that if you have any further queries then don’t hesitate to contact us on the telephone number above, where Jane is on hand to answer any of your questions.